Why doesn't someone open it up again if it was this popular, I suppose the Castle nightclub was Galway's answer to Sir Henry's. Edit: I am aware the original building is demolished but what's stopping someone opening up the venue in a new premises. Last edited by FinkPloyd; 18-09-2018 at 11:12 PM..
Er, because most of the people who went there, are now at a stage in their lives where the last place they want to be on a Saturday night is a night club. Any tickets flying around for tonight?? Wasn't there a website for all the old sweat mixes? Was looking around for it, and cannot find it..so maybe I'm dreaming! How was the Chandler Bing gig? Shift LTD comes back digging again in the past , with an amazing record from house maestro Giorgio Canepa aka MBG . 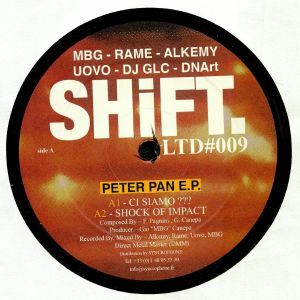 The Peter Pan Ep was made in collaboration with other italian artists , Rame , Alkemy and Uovo in 1992. Reissue include Close to the day lightness edit from DNArt (edit of the original track) and another version of Early in the Morning edited by DJ GLC previously unreleased found in the original tapes. The record is full remastered and pressed with DMM technique to bang the dance floor with quality properties. It comes in 2x12” format , out of Discogs crazy prices. Last edited by Drop; 13-01-2019 at 09:10 AM..